Just hours after a high-stakes drama unfolded Thursday before the Senate Judiciary Committee in Washington, D.C. (and around the world), Hubbard Street Dance Chicago brought up the lights on its interlocking three-part fall season program that harkened back to the creation of the universe and the ascent of man and then proceeded to conjure an apocalyptic vision of where it all went wrong. The entire undertaking took 80 intermissionless minutes of stage time, but the final section of the work began to feel like an exercise in eternity. The Hubbard Street dancers are never less than flawless in their execution of whatever they are given by one choreographer or another. And in this case, the opening work by Jon Boogz and Lil Buck (the co-founders of Movement Art Is, or MAI), which included a partly audible text and a scene of placard-carrying protestors whose posters were blank, held a certain fascination. But the third section of the work, choreographed by Emma Portner – and focused largely on ghoulish scenes of torture and violent power plays with an Orwellian quality – quickly grew tedious in its repetitiveness. And its final section, suggesting a return of human connection, meandered endlessly to no effect. Without question, the real reason to catch this concert is to hear Chicago’s extraordinary, altogether virtuosic, Grammy Award-winning Third Coast Percussion ensemble playing the hugely complex and evocative original compositions by Devonte Hynes, the British-born composer, songwriter and multi-instrumentalist of African heritage who, not surprisingly (just listen to his repeat-till-it-changes riffs) has performed alongside Philip Glass at the Kennedy Center. The fluid, organic movement of the dancers (Craig D. Black Jr., Jacqueline Burnett, Gaby Diaz, Michael Gross, Adrienne Lipson, David Schultz, Kevin J. Shannon and the always animated Alicia Delgadillo) possessed the usual Hubbard Street magic. Third Coast had the stage to itself for the evening’s second section, “Perfectly Voiceless,” during which it conjured a heavenly constellation of sound. In addition to the riveting Butler, the dancers (costumed in mushroom brown tunics) included the petite, intense Kellie Epperheimer, Andrew Murdock, Connie Shiau, Elliot Hammans, Florian Lochner, Alysia Johnson and Black. And Jim French’s dramatic lighting is effective throughout the evening. Again, the primary reason to catch this program is to watch and listen to Third Coast Percussion in action. Both they and the Hubbard Street dancers deserve far more interesting choreography. 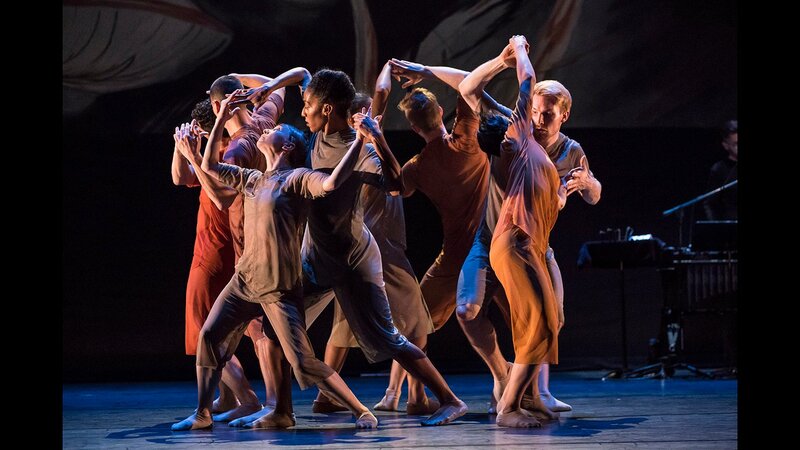 Hubbard Street Dance Chicago’s Fall concert will be repeated Saturday at 8 p.m. and Sunday at 3 p.m. at the Harris Theater for Music and Dance, 205 E. Randolph St. For tickets ($25-$110), call (312) 635-3799 or visit www.hubbardstreetdance.com. Running time is 80 minutes with no intermission.